What happens when you put thousands of business women in a room together? Magic. 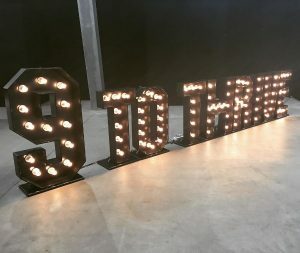 That’s the way to describe Business Chicks 9toThrive event last week – magical. From the glistening glow of the giant letter lights to the carefully selected speakers, the team at Business Chicks sure know how to put on a show. However, it was the segment, Brand Builders, that excited The PromoDonna’s team in attendance. Business Chicks Global CEO, Emma Isaacs seized the role of ‘journalist’ as she interviewed business women from some of Australia’s leading brands; Justine Flynn, Co-Founder of Thankyou products, Tenielle Stoltenkamp, Senior Marketing Manager of Uber Australia, Alyce Tran, Co-Founder of The Daily Edited, and Tania Austin, Owner of Decjuba. Other than being women who are totally killing it in business, they all shared the view that in this day and age, it is essential for a business to be on social media. Social Media has many benefits, one being it allows a business to build brand awareness through targeted messages to their ideal audience, “Targeting your messages is very important… Businesses, especially start-ups, can really underestimate it” said Tenielle Stoltenkamp. But it’s not just having a profile and posting on social media which is essential, it’s establishing an online presence by engaging with your followers, “Investing in that two-way engagement is really really important” Tenielle added. Social Media also allows your target audience to provide direct feedback to your company; “(It’s) a two-way dialogue of where you can get direct feedback… People will say it how it is” said Tania Austin. All speakers stressed the importance of having great content, sharing the tip to purchase a white piece of cardboard to take your photos on if you can’t hire a professional photographer. “It’s all about content… If my photos on Instagram were ugly then I wouldn’t have followers to sell the product to.” said Alyce Tran. Above all, social media is an essential area for businesses to build their brands and communicate with their audiences. So just how much should you spend on social media? “We tell our teams to think no budget, budgets limit you.” said Justine Flynn. The PromoDonna’s team specialise in social media management, including photography and content writing. Enquire today to find out how we can help your brand make the right impression on social media.